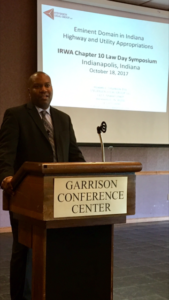 On October 18, 2017, Partner Howard Stevenson was a presenter at the International Right of Way Association’s Law Day Symposium. He discussed Eminent Domain Law. Partner Howard Stevenson appointed to the Fishers Plan Commission and the Fishers Board of Zoning Appeals. Partner Howard Stevenson was a speaker at Purdue University at the “From Relationships to Partnerships” Conference.